Music in the Blood was born out of the cast of TOKENS, David Schein’s 1986 musical based on DeFoe’s Journal of the Plague Year (1677). Staged in the flexible environment of Theater Artaud San Francisco, the critically acclaimed work included 60+ singing, dancing actors and musicians. The creation, rehearsal and performance lasted well over a year. At the end of the amazing run, a lot of cast members wanted to continue singing together. 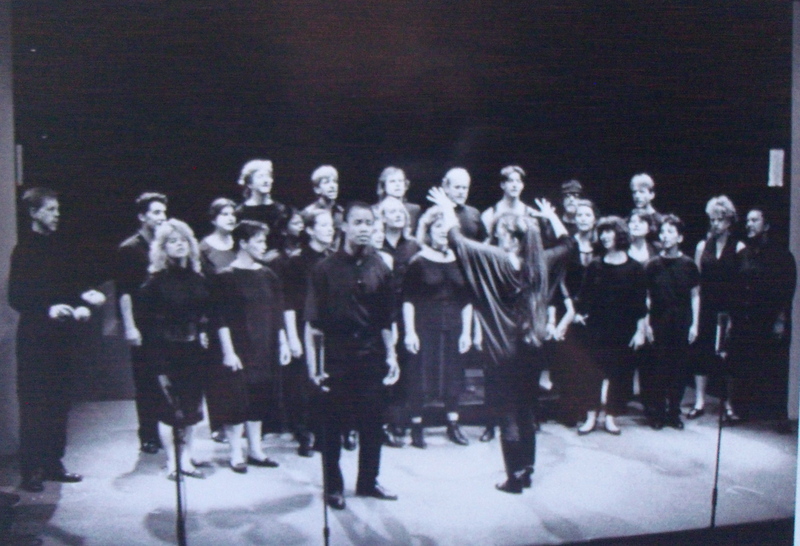 Soon, a choir was convened by popular demand, when Intersection for the Arts requested that Candace Natvig, musical director and co-composer of TOKENS, bring in a chorus to be featured at the first ever Mission is Bitchin’ Festival. The original name of the choir was Blood You Can Trust** but was soon changed to Music in the Blood. We began rehearsals at Studio Eremos in Project Artaud. It was a group with 20+ personnel, many from the TOKENS cast. Almost everyone was connected in some way with the theater scene in San Francisco. 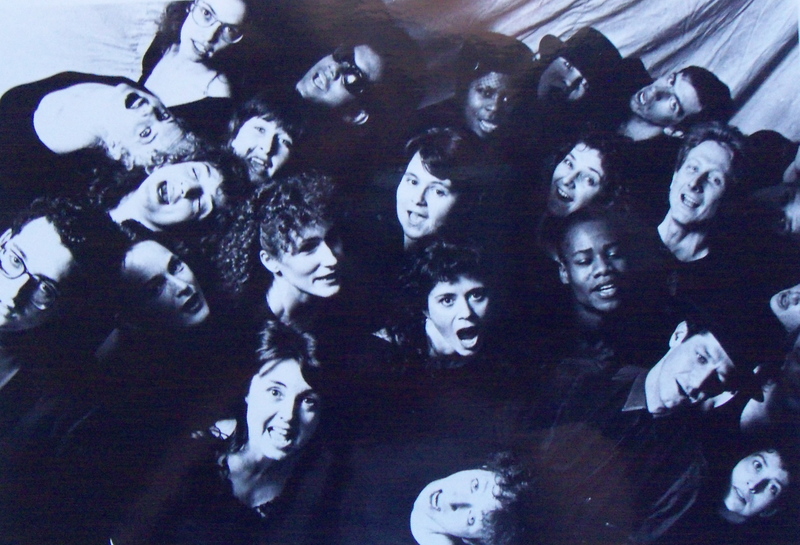 Participants such as director Chris Brophy, choreographer Freddie Long, actors Ron Kaell and Karen Hott, performance artist Michael Peppe, composer Barney Jones, theater tech Mark Hidzick, playwright Dan Turner and many others speak to the choir’s origins in the San Francisco theater community. **Soon after the choir’s inception Candace acquiesced to pressure to change the name. As AIDS awareness grew, some community members felt that Blood You Can Trust could be interpreted as a reference to blood-born pathogens, and possibly suggest a subtle form of discrimination. So the permanent name of the choir became Music in the Blood. A lot of people have asked me why the name of my choir had to include the word blood. Here’s my answer: Blood is fundamental, essential, innate, flowing, inevitable, everywhere within, and when you lose too much of it, you won’t survive. And that’s what music is for me. These roots, in Bay Area theater, in Tokens specifically, in the deep tradition of theatrical music, these are the threads that I followed in creating Music in the Blood. Repertoire tended to lean toward material that might be called dark or ironic. 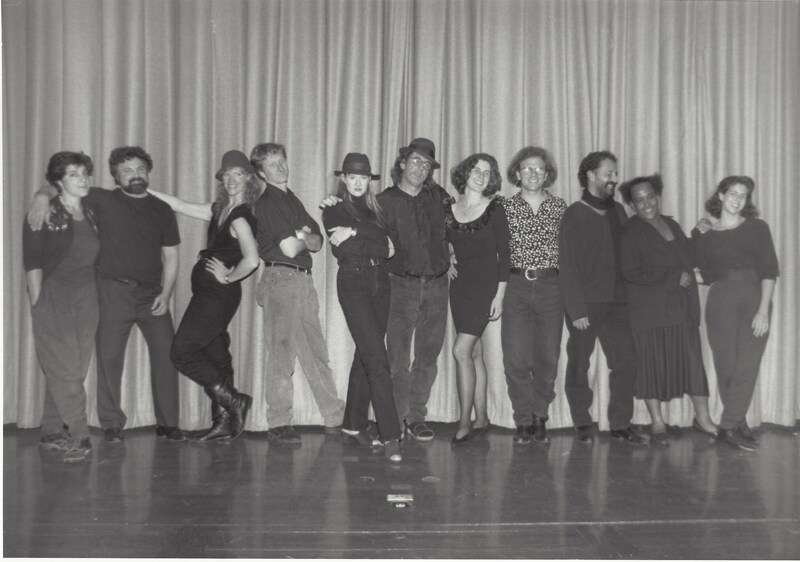 Starting with the inspiration provided by my personal favorites, especially Kurt Weill and theater composers I encountered in San Francisco, I decided I wanted to form a choir that would perpetuate the music of theater, especially Bay Area Theater. I searched out works by composers who were locally prominent at the time: Contraband, JPSkratts, Scrumbly Koldewijn, Z-Collective, Chris Brophy, Al Agius-Sinerco, Barney Jones, Michael Charnes, Jim Nisbet, David Schein and a host of others. The issue of where to rehearse a big choir, often accompanied by piano and/or rhythm section, led us to walk through many doors. After Studio Eremos I was able to secure a studio at Project Artaud, and that was our rehearsal space for a few years. It had a piano, and in the early years we often performed with an accompanist, Dwight Okamura, who took part in in some of our big numbers—the theme song from Lost in the Stars, sung by Alan Carter; or the Brecht-Weill excerpts from Three Penny and Mahagony, where the singing and acting of Ingeborg Weinmann and Karen Hott brought people to the edge of their seats. But eventually we shed the domineering piano and became an a capella choir with occasional sparse accompaniment. Multi-instrumentalist Jon English accompanied on many of our concerts, playing trombone, bass and percussion. And our friend Asa Murray came in to play guitar on occasion. Then he turned out to have a wonderful voice, and stayed on as our one true bass. Eventually, after a time rehearsing in Fran Sholley’s living room, we were given the privilege of practicing in the auditorium at Laguna Honda Hospital, where Bing Crosby used to hold his Christmas broadcasts. There, we performed often, for both the retired and confined communities. Collaborating with San Francisco theater companies was one of the important missions of Music in the Blood. One of the more successful of these collaborations involved the creation of music for the Z-Collective’s performance of Good Night Desdemona, Good Morning, Juliette. For this, Candace composed an extensive harp part and directed the choir in improvising time-warp music and war scenes as well as performing works by Morley and Purcell. Other noteworthy gigs included our participation in the sound track of Bram Stoker’s Dracula; our indescribable performance of Next to Torture, Art Persuades Fastest, by Jim Nisbet; an appearance at the San Francisco Sand Castle Contest; on radio at West Coast Weekend; in the subway for the San Francisco Art Commission; and our world premiere of a new choral work by Barney Jones, Quark Ballad, for the Stanford Linear Accelerator team conference. At the same time we endeavored to spread good cheer to confined populations, especially at the holidays, by our performances at the San Francisco Aids Hospice, Laguna Honda Hospital, as well as the Tamalpais and other retirement facilities. A look at the list of performances of 1992 illustrates how active the choir was in its day, and what a great diversity of gigs we played. Include the page that lists gigs of 92. Have it in a box, or have a link to it if it’s on another page. In addition to our work in Bay Area musical theater, many of us were also attracted to folklore-based music with themes around personal and political struggle. Eventually we branched out into performing works by Lady Smith Black Mombazo, Malcolms’ Interview, Sweet Honey in the Rock, and others. These pieces I transcribed from long-playing vinyl and arranged for our choir to perform. Over time, we were able to build a repertoire that defined our unique cross-cultural, political, theatrical and musical interests. In retrospect, though we were sometimes criticized, I’m proud of the risks that we took at that time, to explore the joy and meaning of any music that attracted our interest, without regard for outside opinion or political correctness. Over time, new blood came in. The choir began to attract members with trained voices, the ability to sing in foreign languages and in a variety of styles. Kate Rowland, Joe Fanucci, Robert Mittman, Mark Christiansen, Amy Lodato and Liz Cross are some of the members who had music education and deep experience in vocal performance. Their beautiful quality voices raised the level of tone and confidence to that heard in the Sakha Umzi concert.